Book 19/25 in the 2011 Reading Challenge. Date completed: August 26, 2011. Before I Fall is the story of the last day of Samantha Kingston's life. I have been trying to stay away from young adult titles (aside from my Hunger Games obsession) but I spotted this book cover on Pinterest and was intrigued. I know, I just can't help myself though - I judge books' readworthiness by their covers. Samantha Kingston is a popular high school senior with a trio of best friends and a dreamy (although kind of a meat-head) boyfriend. 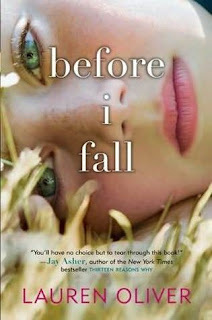 Before I Fall starts out on the first of a "Groundhog Day"-style repetition of Friday, February 12. Samantha relives Cupid Day seven times before she finally "figures things out" and ends the cycle. I'm not going to lie. I didn't like this book in the beginning. First of all, she starts out as a snooty brat teenager - the type of girl I spent my high school years avoiding. At one point she refers to the special needs students in the cafeteria as something along the lines of "the short bus parade dribbling their applesauce." That pissed me off, if I'm being quite honest. I spent a lot of time in high school as a T.A. with the disabled students, so I'm a touch over-sensitive, but come on. Seriously! Even as I tried not to get into the book, with it's long chapters (277 pages are split into only seven chapters - each of which is a new play-out of February 12) and it's teen-speak and all of the high school drama and ridiculous-ness... Plus, I felt like it was a blatant, modern-day rip off of Groundhog Day, and I actually quite enjoyed that movie through my youth and even still today. I found, though, that as each chapter went by, Samantha Kingston became more and more bearable, so that by the end I was really rooting for her and appreciating her ordeal. By the end I didn't want to set the book down any more, the anticipation to see how things would turn out for Sam was just killing me!